I love the section on growth because it encourages us to pamper ourselves, to take time for ourselves, to make certain that we are treating ourselves well. As an “extreme self-care” enthusiast, I love all these things. At the start of every weekend, I take out my journal and I make two columns. One column is a list of all the things I “NEED” to do on the weekend and the other column is a list of all the things I “WANT” to do on the weekend. I love being productive and getting things done but also know that I need to cater some to my fun, creative side so this method works for me. The things I “NEED” to do are normally things like laundry, clean kitchen, weed plants, rake. The things I “WANT” to do are things like cook a pot of soup from scratch, sit at the park with my journal, go horseback riding, go to a matinée of a movie I’ve been wanting to see. I normally make these lists pretty long – twenty or so items per column. I never get them all done but I have the things written down that I need to do – the things that I will feel bad at the end of the weekend if I haven’t done – and the things I want to do – those things that will really feed my soul and make me feel like I’ve spent time in a special way. So, how does this relate to self-care and growth? By making these lists, I’m insuring that I do things I need to do but also that I want to do. As many of you, I work Monday – Friday so my weekend time is sacred. I want to make the most of it. This allows me to grow and be more creative. Lists aren’t for everyone, I know, and in some ways, they do seem a bit uptight. But, I like having it all written out in my journal and it helps my spirits unbelievably. *** How do you balance need with want? What things do you do to show kindness to yourself? What will you do this very weekend? I have not learned to balance need and want, yet. Actually, I hadn’t really thought about it being a balancing act until I read your post, Rebecca. Now I see why I sometimes rebel against house chores and at other times I happily whiz through them. I felt it would be kindness to myself to follow Cheryl Richardson’s book, The Art of Extreme Self-Care. I allow myself to sleep until I feel rested and ready to get up. I mentally run through happy thoughts as I lay in bed just before exiting the covers. This weekend, I’ll enjoy breakfast while taking in the beautiful nature that’s outside our window. I love this idea! I may give it a try soon! I too make lists but generally of the things I need to do. I try to keep my weekends as free as possible so that I have time to walk or watch a movie or take care of some wants in an unscheduled sort of way. This weekend I’m going read from Brenda Ueland’s book, If You Want to Write, get some sleep, and (this could fit into the need or want category) eat Halloween candy on Sunday! Great idea to make the two lists. Not working fulltime right now, it’s easy to feel that you are not getting anything done that is productive. 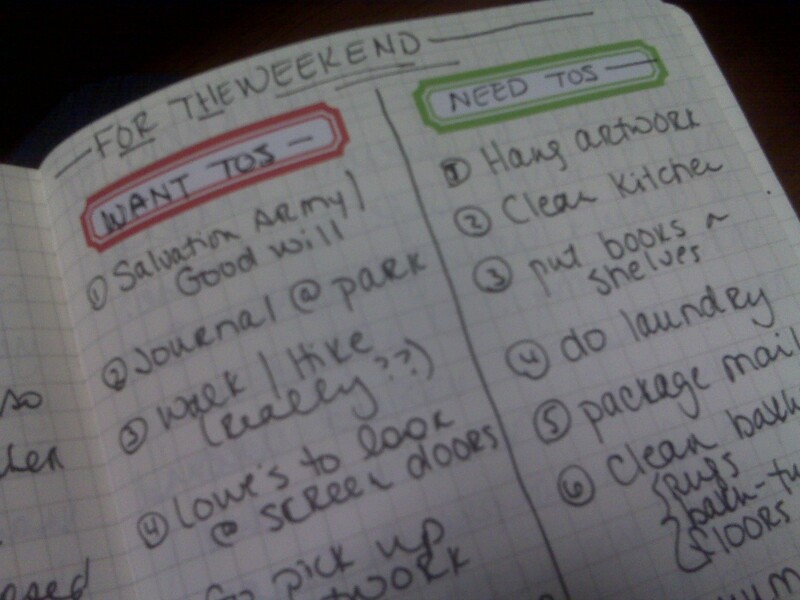 Even with a little more time, the lists are a good idea, so you feel that you are productive. Just took a restorative yoga class which always feels like you are taking care of yourself.